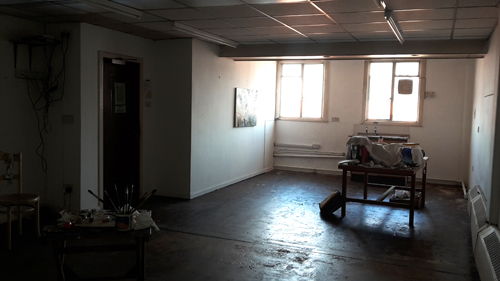 In August this year I moved artist’s studio within the same building – WASPS Studios, West Park Place, Edinburgh. 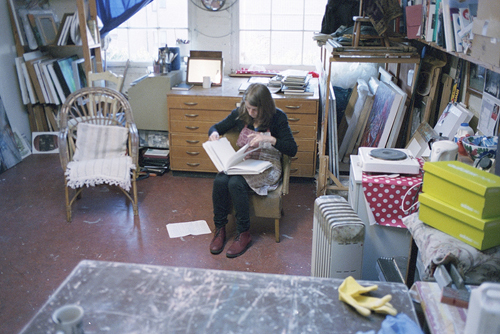 I had been in my previous studio for twenty three years! That is a long time to be in an artist’s studio. My years there had been marked by a lot of hard work using a range of materials: oil painting, egg tempera and fresco, and changing subject matter from abstract to figurative – finally resting somewhere in the middle. I had seen some failures, a few successes, and annual rising rents. 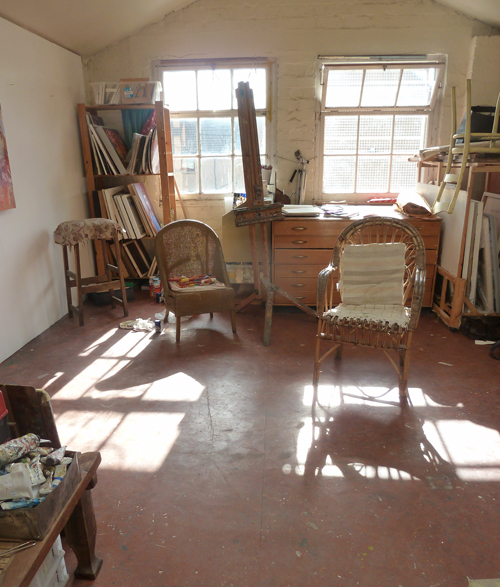 Family, friends, students and art lovers had visited my artist’s studio to see what I was up to. Each of my daughters had accompanied me a few days a week when they were babies, sitting in the same bouncy chair that other artist mums had used for their offspring. The place certainly had a buzz of art and life about it. I loved the dolls’ house shape and the glorious light. So, why did I move? 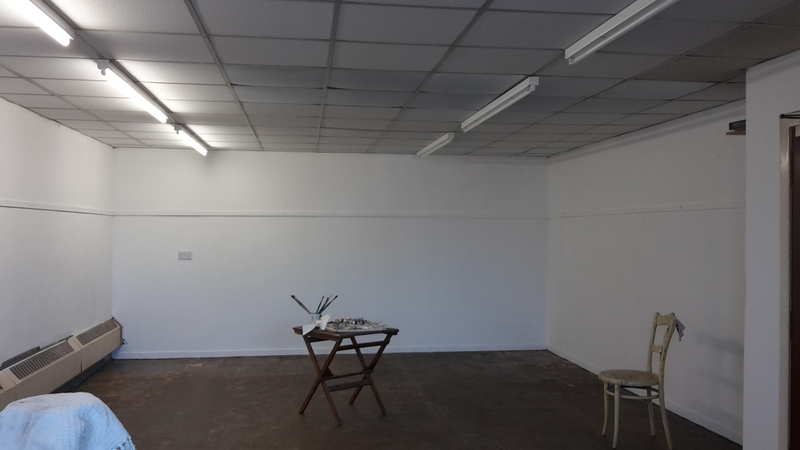 Well, the changing use of the building over the years, with more emphasis on artists running classes, meant that my WASPS studio had become a noisy place to be, with footsteps and voices outside my door about every five minutes – seven days a week. It started to affect my concentration. I longed for somewhere quieter. A space came up in the building. It had a low ceiling covered in polystyrene tiles, very poor light which would mean having the fluorescent strip lights on at all times, and it was double the price! But it was bigger and, more importantly, relatively quiet. Of course, no space is totally quiet and I have traded in old noise for new – building work, smoking students chatting in the lane, daily bin emptyings, the occasional radio. But it is a relief to be able to concentrate on my work without hearing soles slapping on the linoleum stairs and mobile phone conversations inches from my work station. So, despite my new WASPS studio resembling a seventies boardroom, I actually really love it. I have wasted no time getting down to work, making good use of the large wall space to work on several big paintings at the same time. Now that I have been there for two months and have completed four new paintings, I can start thinking about the finer points of making a nice artist’s studio. This will involve getting some cushions, shelves and storage units, and tearing down the false ceiling to let in more light. WASPS, 2/3 West Park Place EH11 2DP are having Open Studios on Saturday 3rd (11am-5pm) and Sunday 4th November (12noon-5pm) 2018. Come along and see my new space.